What’s the first thing you do in the morning after acquiring your favorite form of caffeinated beverage? I bet you answered: “Check email”. We are like Pavlov’s dogs. However, instead of salivating at the sound of a bell, we are conditioned to immediately check email upon hearing the sound of incoming mail. And, in doing so, productivity is lost. We waste vast amounts of time, money, and IQ points. Yes, it’s true: IQ-points. My favorite stat comes from Dr. Glen Wilson at the University of London’s Institute of Psychiatry. He found that found people distracted by constant email and phone interruptions suffered a 10-point drop in their IQs. So, what does this mean. Well, you only lose approximately 4 points in your IQ after smoking marijuana. (This is a little scary to me.) Or if you missed a whole night of sleep, you might drop 10-points in IQ. So, thanks to Dr. Wilson, I’m really trying a little harder to minimize the amount of times I check my email. How can you manage your inbox and be more productive…and maintain your IQ? Stop the madness. Refuse to be controlled by the bell. Check your email twice a day at predetermined times and stick to it. Seriously, anyone with a true emergency will pop in and see you or pick up the phone and call when their email elicits no response. Send all your colleagues a notice informing them of your new email policy. Make sure you block enough time to handle emails and protect that time from interruptions. Take out the trash. Here you are at the appointed hour merrily downloading all that email. Before you get down into the nitty-gritty, scan the new messages and delete all that don’t require feedback, don’t need to be saved or shared and those random unsolicited messages that are somehow always there. Now you can focus on those emails that require action. Adopt a “Touch It Once” philosophy. The trash is out. Your new mission, should you choose to accept it, is to open each piece of mail and take any and all action(s) required to make said email go away. As in permanently into the trash bin. Yes, I realize it may not be possible to make it go away every time – but try. Try very hard. Each time you open the same email, it’s time, money, and IQ points! Don’t use the inbox as a running task list, don’t drop the email into the “Face Reality Later” folder, and don’t use the inbox as a deep reference pile for the project your team is working on. Your new mantra is: “Deal and Delete”. The sender asking you to perform a task related to your project. No worries! You can create a task right from your Gmail or Outlook accounts. See Redbooth for Gmail and Redbooth for Outlook. The email can be converted into a task or action item related to a project? If so, see above. The email contains attachments with information related to a project. Use Redbooth’s Files feature so project information can be shared amongst team members without forwarding the email to ten of your team members’, closest friends’, uncles’, cousins and dealing with the “Reply-All” insanity that ensues. The email contains reference information related to a project. Consider placing that information into the project notes. Notes can be used for sharing meeting minutes, plans, and – you guessed it –announcements. Like the announcement you are going to make specifying when your email inbox is open for business. The email is addressed to multiple people and requires an interactive discussion to resolve. If it’s something informal consider using the project conversations function where the team can have a centralized discussion about the topic. 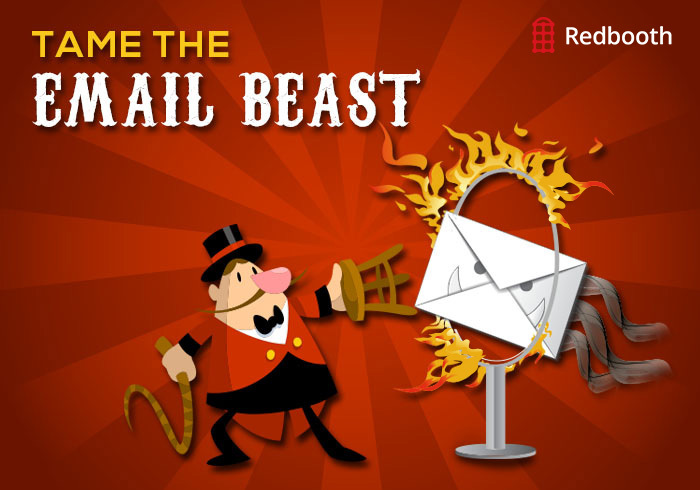 Do you have ideas to share on how to tame the email inbox beast? Check out our “5 Secrets to an Empty Inbox.” We want to be more productive and maintain our IQ, so what other tips would you add to our list? Share your thoughts in the comments below.